The treacherous waters off of Hatteras Island are known as the Graveyard of the Atlantic. 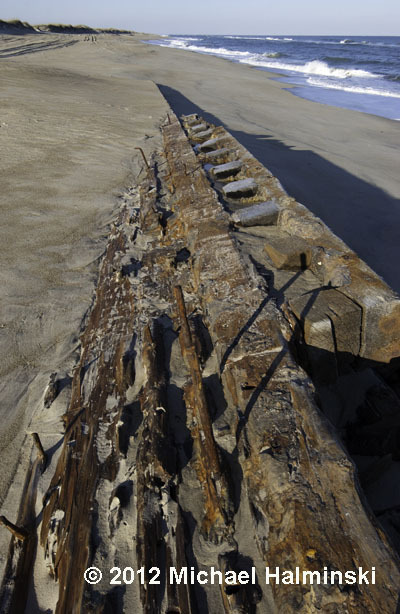 Remnants of old shipwrecks can still be seen periodically as the shifting sands reveal these artifacts. Interestingly, these ships were frequently salvaged for their timbers. Timbers from the Loring C Ballard rest on the beach south of Salvo. Years ago, I watched Pete Covey replacing a sill of a home built in the late 1800’s. 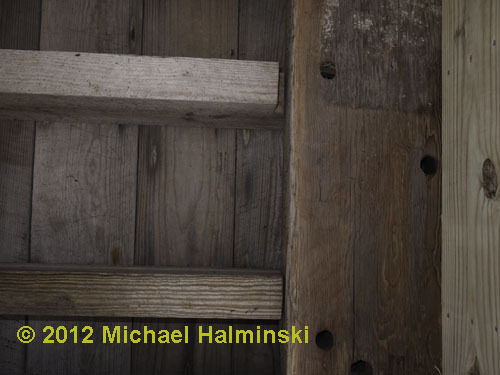 The old sills were timbers from a shipwreck, and a piece was discarded. Back then I used a wood stove to heat my house, and when I put a chain saw to it, the sparks flew, and the saw would barely cut the wood. As it turned out, the wood was very old heart pine. I gave up cutting and had to replace the ruined chain. That wood was extremely tough. 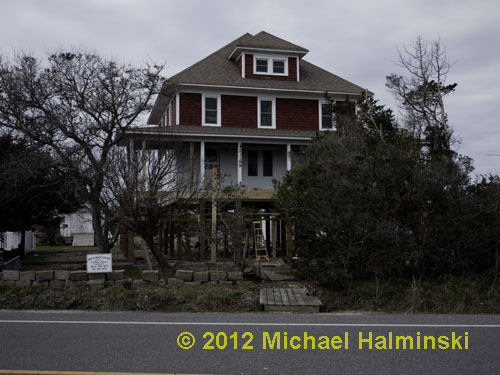 Since Hurricane Irene, I’ve noticed a couple of other homes built incorporating the timbers savaged from wooden sailing ships. Levene Midgett’s home was built in the 1920’s. Levene was a keeper at Chicamacomico Coast Guard Station. 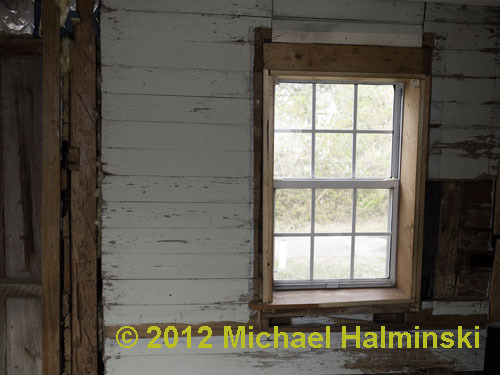 This building’s sill is framed with 4×16 heart pine timbers, and is in beautiful condition. 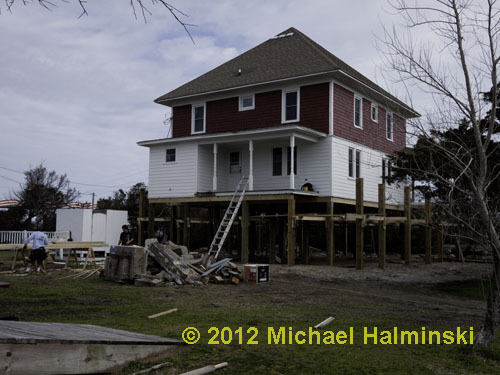 It was flooded to the first floor windows during the storm, and has been raised significantly to avoid future flooding. 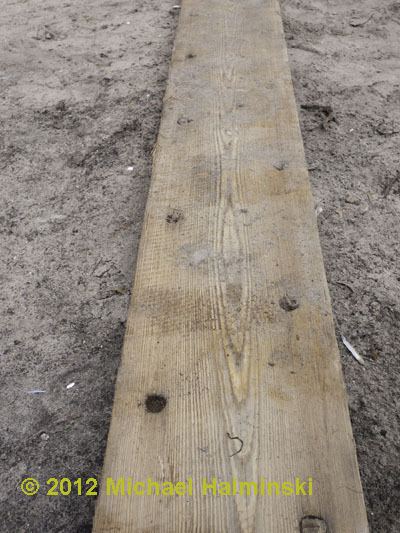 This massive timber supports an exterior deck. 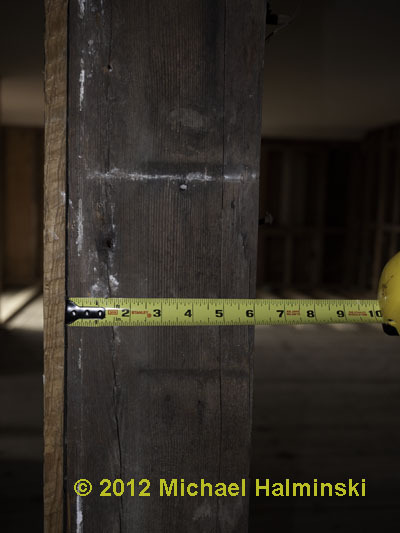 Floor framing detail under Levene’s house. 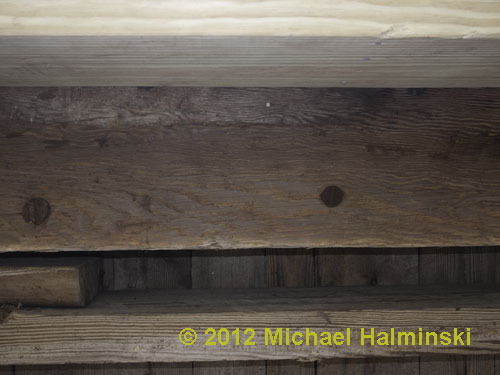 Looking up at the main sill supported by new pressure treated lumber. The massive beams look as good as the day they were salvaged. There’s still a lot of work to be done so that Levene’s descendants can reoccupy the house. 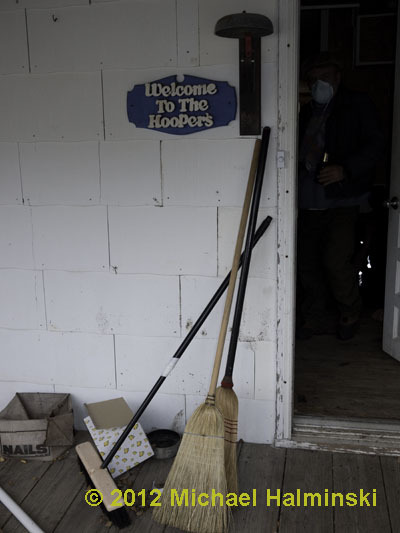 Another home affected by the flooding was Elsie Hooper’s place in Salvo. I have recently learned that this building is well over 100 years old, and unfortunately is scheduled for demolition. The inside was stripped out in hopes of saving this relic, exposing parts of it history. A beautiful heart pine timber acts as a post next to a steep narrow stairway. 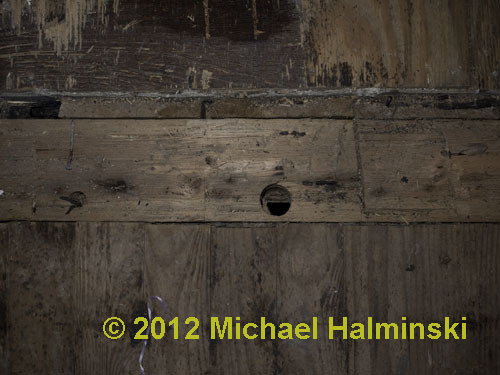 A floor frame still has a hole in it for a wooden peg. 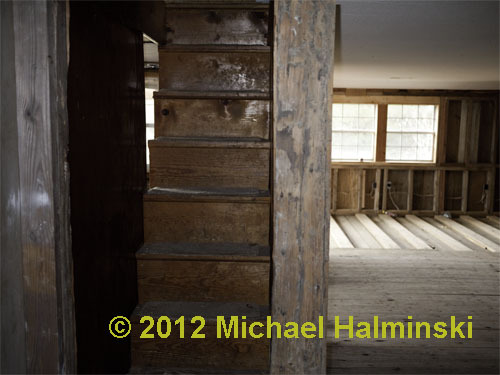 Two vertical beams (left) meet where the original building had an addition built to meet it. The walls were braced for extra strength. 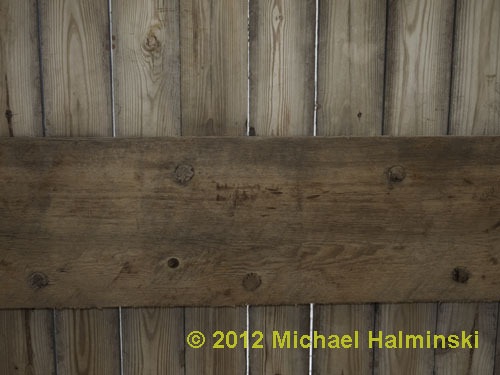 Another 4×6 ship timber of heart pine. 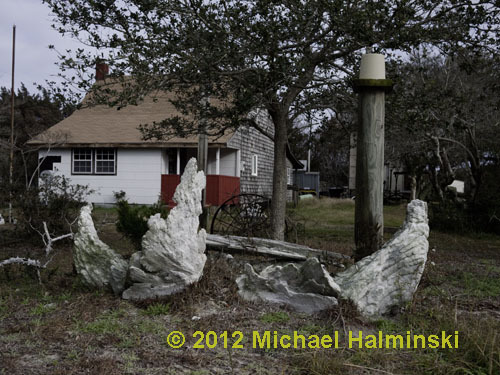 The yard is decorated with the bones of large whale, collected many years ago. By next week the old homestead will be no more. 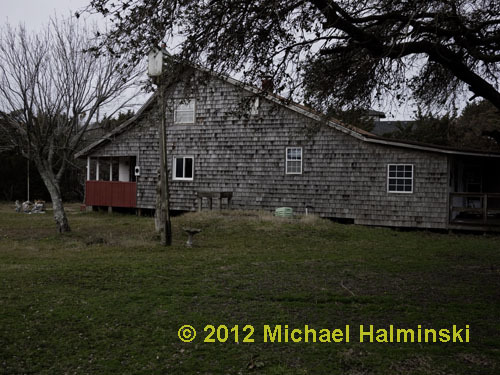 This entry was posted in beach, buildings, Outer Banks, shipwrecks on January 30, 2012 by j0jgvm89bj.